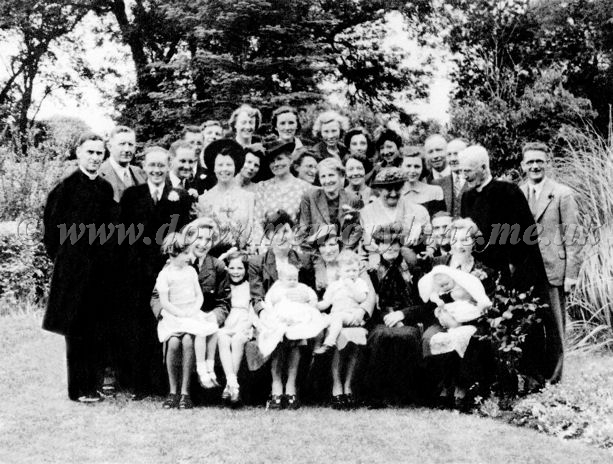 It's 1943 and the Second world War rages on in Eurpoe but we are here in Newtownstewart to enjoy ourselves and celebrate the wedding of James Stevenson and Mona McAdoo. is Spencer Stevenson and on the extreme right behind the minister is "Big Jim" Stevenson from America.The minister on the left is Rev. Gabby then the Groom James Stevenson and beside him his lovely bride now Mrs Mona Stevenson then behind them is their Best Man Jack Stevenson. Seated on the left in her splendid WAAF uniform is Corporal Jenny Stevenson, the lady with a baby on her knee is Mrs Gabby and at the end of the row also with a baby on her knee is Mrs McAdoo.